Deed Book C, page 306, Logan County Clerk’s Office, Logan, WV. This property is located in present-day Lincoln County, WV. Deed Book C, page 270, Logan County Clerk’s Office, Logan, WV. I descend from three of Hamilton Fry’s siblings: Christian Fry, Emily Fry, and Druzilla Fry. Thomas Dunn English was a well-known poet. This land is located in present-day Lincoln County, WV. Deed Book C, page 271, Logan County Clerk’s Office, Logan, WV. I live on part of the old Elias Adkins farm. Deed Book C, page 265, Logan County Clerk’s Office, Logan, WV. Deed Book C, page 266, Logan County Clerk’s Office, Logan, WV. Burbus Clinton Spurlock (1851-1940), son of Robinson and Nancy (Cummings) Spurlock of Jefferson District, Lincoln County, WV. About 1876, he married Nancy Ann Fry, daughter of Hamilton and Nancy (Hunter) Fry, of Big Ugly Creek. He lived at Midkiff in Lincoln County, where he appears in 1900 and 1910 census records. He was a well-known capitalist in the Guyandotte Valley, retiring to Huntington. In 1862 my company was ordered to move from Chapmansville down the Guyan river. About three o’clock that day we ran into a company of Federal soldiers at the forks of Big Ugly creek, and as neither company was expecting trouble at this time, we were not ready for the fight, but our captain ordered his men in line, and we marched around the hillside, fronting the creek, and the Federals formed a line up the creek, fronting us. Here we tried our bravery for a few minutes, but as we had the advantage of some timber, the Federals broke ranks and went into the woods, except ten or twelve that lay flat upon the ground, and we captured them, and all the rations the company had, such as coffee and sugar, which was a treat for us in that country. About this time another company came up and followed the Federals into the woods. I never knew what became of them until after the war. Mr. T.E. Ball, of Mason county, told me after the war that he was a member of that company of Federals, and he was in the fight at the forks of Big Ugly, and that he was in the closest place that day of any time during the war. he said he was certain there were more than fifty shots fired at him as he ran through the field, and of the eighty-four men in his company, there was not a man that returned with his gun, and but few that had hats or shoes, for they were scattered in the woods and every man looked out for himself. The next day, we had six men in the advance guard. I was one of them, and as we turned the point at the mouth of Six Mile creek, six miles above the falls of Guyan river, we ran into a squad of seven Federal soldiers, who fired into us and killed William Jefferson, one of our bravest soldiers. The next day we crossed the river at the falls of the Guyan and went through Wayne county into Kentucky. Here we were fired into every day and night for about three weeks. It was December and we had some very cold weather. Several times I have seen men and horses lying on the side of the road frozen so stiff they could not travel. We had about fifteen hundred men with us at that time. We had several hundred prisoners and a great deal of army supplies that we had captured, and the cold weather and the Federals and so many bushwhackers to contend with, that we had no rest day or night. Just below Prestonsburg we captured seven flat boats that were loaded with army supplies, such as clothing and food, and many of us needed both, but we paid dearly for them, for many of our men on both sides lost their lives in this fight. For two hours and thirty minutes they poured the hot lead into each other as fast as they could. The battle lines of both armies extended from the river to the top of the mountain. I was on top of the mountain when the Federals broke rank. Our major ordered his men to go down both battle lines and gather up the dead and wounded and take them to the foot of the mountain. I went down the Federal battle line in front of our men, and when I saw the dead and wounded and the guns and blood and clothing that was scattered from the top to the bottom of that mountain, I was perfectly disgusted with war. About half way down this line we found their major; he was shot through the heart. He was a nice looking gentleman; he had a long black beard. Our men seemed to have great respect for his body, because he was an officer, and gave special directions for his burial. Some of the prisoners cried aloud like children, while others cursed and said they were see every rebel in hell before he would cry. Just how many men we had killed and wounded in this fight I never knew. Some of our wounded we took with us, and some was so badly wounded we left them in private homes. From this places we turned to the south for winter quarters. My company was the rear guard that night. We thought the rear guard would suffer more than any other part of the army, but to our surprise after we had gone a few miles above Prestonsburg we heard considerable shooting and disturbance in our front about two miles from us. It was a very dark night, and when my company came up to about where we thought the shooting was, we heard horses and men groaning. After we had gone about two miles farther, we went into camp until morning. That morning one man told me one of our men that was killed last night lived in Parkersburg. The great question with us at this time was, can we ever get back to Dixie with our cattle, goods and prisoners? The Federals were above us and below us. Source: From Youth to Old Age by T.H. Perry, Chapter 7, p. 18-20. Note: As of 1862, Lincoln County did not exist and the surrounding area remained a part of Virginia. Big Ugly Creek was then located in Logan County and Six Mile Creek was located in Cabell County. Note: The “forks of Ugly” references the mouth of Laurel Fork, at or near the old Hamilton Fry homeplace. 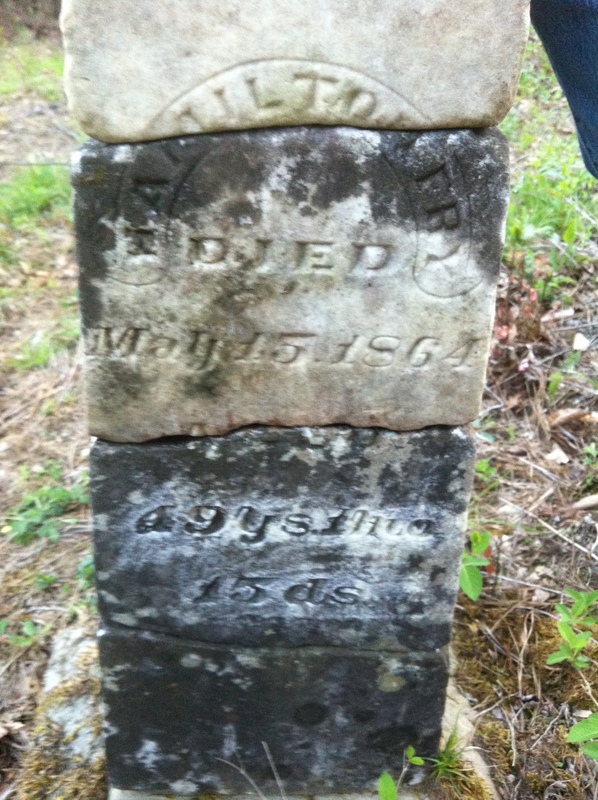 Hamilton Fry (1815-1864) grave, located at Leet on Big Ugly Creek, Lincoln County, West Virginia. I took this photo in 2011.